Whether or not you personally use marijuana, you may have trouble getting the distinct odor out of your home. In today’s apartment and condo style homes, it’s easy for smells to drift between residences. While some products might mask the smell, few things work as well as an air purifier for marijuana odor. Since marijuana has only recently been legalized in certain states, research focused on removing marijuana odors from homes is basically nonexistent. For similar reasons, there are fewer products available to help with marijuana odor removal. 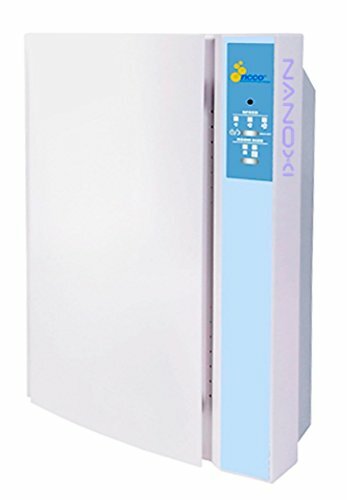 Many air purifiers, however, remove odors as they clean the air, and air purifier designers have long since perfected the art of removing cigarette smoke and odor. So before you order a traditional air purifier for marijuana odor… or read our guide to the best air purifier for weed smoke; check out the NANO2 deodorizer. It might be the solution you’re searching for. Specifically designed to handle marijuana odor, the NANO2 relies primarily upon patented NCCO filtrations. It’s a little complicated so here’s a video from the manufacturer’s website. The NANO2 has a range of up to 2,500 square feet, which means it can handle an entire house on its own. The manufacturer recommends placing the NANO2 near the source of most marijuana smells, but most deodorizers and air purifiers work best when kept near the primary source of the odor. Most air purifiers can only handle, at most, a single large room. The NCCO process that removes odors is patented, and although the machine is specifically designed to handle cannabis smells, it can remove other odors from your home, as well. It won’t necessarily purifier your air, removing toxins like an air purifier can, but it can deodorize a significant range of smells. It’s also important to note that the manufacturer explicitly states that the patented NCCO process is only designed to clear odor from moderate cannabis use. The NANO2 comes with a sixty-day money back guarantee, so you can make sure it works for you and your home without jeopardizing your investment. Since the product is so new, genuine customer feedback is hard to come by. Thus far, however, it is overwhelmingly positive. According to reports, the NANO2 gets rid of not only cannabis odor but also the pesky stink of litter boxes. Since cat urine is one of the most difficult smells to eliminate, this is an excellent sign that the product not only works but works well. First, let’s look at how air purifiers remove odors. The most effective odor-removing filter in an air purifier is usually an activated carbon or charcoal filter. Carbon and charcoal filters purify through chemical absorption. While they work very well against most odors, there are some chemicals that carbon cannot absorb. These include sodium and nitrates. Users must also replace carbon filters regularly. Once all of the active sites have been filled, the filter will no longer function. HEPA filters can, theoretically, also remove odors. But we don’t think you should expect them to remove odor. They way HEPA filters remove odors by simply removing particles from the air you breathe. But the particles must be large enough for the filter to capture. So when a HEPA filter captures odor; the odor is either attached to a large particle or happens to get trapped by chance. Since these particles register as a scent to humans, the more that an air purifier can trap, the less smell a human can detect. Carbon filters are often cheaper, and many air purifiers place a carbon filter ahead of a more expensive HEPA filter. To learn more about activated carbon check out our ultimate guide, here. Marijuana creates a stubborn odor, and as its use becomes more widespread, it’s only natural that homeowners want to limit its effects. The choice between air purifiers and the NANO2 is not so simple as it seems. Think very carefully about what you need from your product before you make any final decisions. Based on initial praise, the NANO2 may clear odors better than a traditional air purifier. That said, the NANO2 cannot clean the air like a purifier, and it costs about as much as a mid-range purifier would. An air purifier should remove a substantial portion of marijuana odor, at the very least. The best air purifiers may remove it entirely. Since products to remove marijuana odor are so new to the market, however, there is very little information about how well existing models can handle this challenge. This skews any comparison between air purifiers and new deodorizers for marijuana. If you have allergies, however, and you hope to remove the smell of marijuana may help, it might be a better idea to buy an air purifier. An air purifier that is highly effective against cigarette smoke is probably your best bet. On the other hand, the NANO2 seems to be very good at what it does. Previous buyer feedback is still coming in, but so far it’s incredibly positive. The design and features are also very impressive. Unlike most air purifiers in the same price range, the NANO2 can deodorize an entire house. Since it’s specifically designed to target marijuana odor, it looks like the most efficient deodorizing product currently available. The fact that its filter never needs a replacement is another serious bonus. Without the cost of biannual filter replacements, you can save hundreds of dollars within a few years. The only serious concern is the fact that the NANO2 is only rated to handle moderate marijuana use. So far, the NANO2 looks like the best option for those who simply want to remove pesky marijuana odors from their homes. It hasn’t been thoroughly tested by users yet, but that is the only real gamble prospective buyers must face.